Since 2005 VILLA AUSBLICK ('Villa with Views' in German) has been a 5*-rated choice for special family reunions or larger group retreats seeking that perfect, very private Vermont getaway. 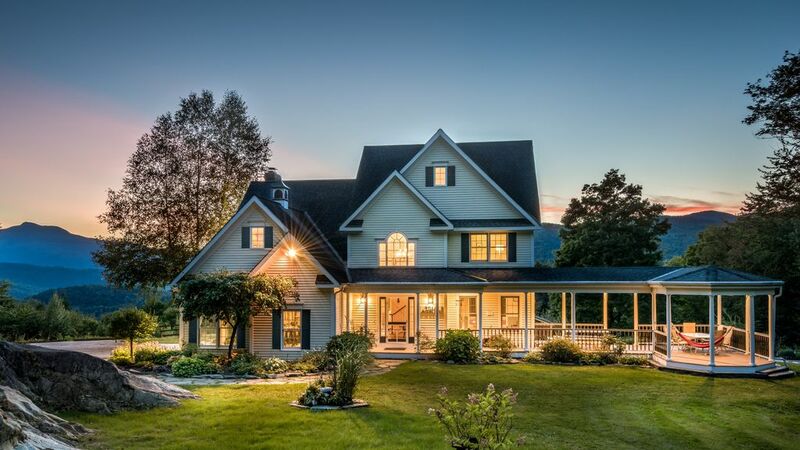 This luxurious yet kids-friendly, mountain-top house on a secluded 5-acre wooded lot in Waterbury Center, VT comes with a seasonally available private outdoor hot tub or swimming pool. Available year-round you can enjoy many summer and winter recreational activities within a short drive to hiking and mountain biking trails, golfing, tennis, water sports on Waterbury Reservoir and winter sports at 3 amazing ski mountains: Stowe (17.8 miles/30 min); Sugarbush (21.7 miles/35 min) and Bolton Valley (13.6 miles/20 min). Culinary and craft beer aficionados will be delighted to discover the many great restaurant and brewery options nearby. If home-cooked meals are your preferred choice you'll enjoy Waterbury's farmers market and large grocery store to prepare a feast at Villa Ausblick's stacked gourmet kitchen. Our team of housekeepers, pool/hot tub service staff, landscapers and property manager take great pride in providing our guests with a very well maintained property. To make your stay even more memorable we can arrange onsite concierge hospitality services including personal photographer, chef, babysitter, masseuse, or any special wishes you may have. WE ENCOURAGE ALL GUESTS TO BUY TRAVEL INSURANCE. We are East Coast city folks who love Vermont and its pristine Green Mountains. When our children were born, we decided to buy that dream vacation home allowing our family to have a wonderful, well-balanced 'double life'. We chose the Waterbury, VT location for its proximity to various ski resorts (Stowe, Sugarbush, Bolden Valley), great recreational and culinary offerings, and easy access to I-89. VILLA AUSBLICK is a family-friendly sanctuary for discerning vacationers seeking mountain solitude. It is a very unique rental property that serves the varied needs of many different guests which could be a large, multi-generational family reunion or a group retreat coming together for a vacation, to celebrate the Holidays or a special life milestone (big birthday, engagement, wedding, baby shower, college commencement). For me personally VILLA AUSBLICK is simply the perfect place to tune out from my busy day-to-day life, reconnect with nature and find my inner peace. Once you arrive, you will understand. All full bathrooms offer plenty storage, come with towels, hair dryer and bathroom toiletries..
Waterbury, VT is the gateway to the Green Mountains near Stowe, Sugarbush, Bolton Valley and Mad River Glen. The Green Mountain Byway – running through the towns of Waterbury and Stowe – provides four-season access to Vermont’s premier outdoor recreation region offering world-class downhill skiing, snowboarding and cross-country skiing, hiking, mountain biking and road biking. Villa Ausblick's mountain-top location offers pristine wilderness vistas. The nearby Waterbury Reservoir offers plenty recreational activities including swimming, fishing, kayaking, canoeing, stand up paddle boarding plus 22 picnic sites, tables, hibachis, swimming beach, nature trail, trailer boat ramp, concession area and restrooms. 7 miles of unrestricted views of Camel's Hump Mountain... just read guest comments for raving reviews! South-facing you can admire sun sets. The house is great, just as described in the pictures. Kitchen was stocked with good cookware, everything was clearly labeled, bedrooms are all a good size, and common space was perfect for a group of 12. Hot tub was nice to have and overlooks a beautiful sunset at the end of the day. My group had a great stay, definitely recommend it. Thank you for your 5* compliment. Optimizing the living space for the needs and comforts of a large traveling group definitely takes some thought. We are glad you enjoyed your stay. We are a large family - 12 adults and 2 small children - and Villa Ausblick made for the perfect family vacation. The pictures here can't adequately capture the beauty of the property and home. Your time at Villa Ausblick will exceed your expectations. The property speaks for itself - what I want to emphasize is how outstanding the property owners are! From the very beginning of the process, Sibylle was incredibly helpful and responsive to every single question and need that we had. Sibylle and Peter have mastered the vacation rental concept. The home itself is designed for guests that are unfamiliar with the place (drawers, cabinets, closets, light switches, etc. are all clearly labeled.). They provided us with a detailed guide to the house including instructions for everything like the hot tub and appliances. Sibylle has created walk through videos that you can watch before you go so that you know exactly what you do and don't need to bring with you. Bottom line - we could not imagine a more lovely home and hosts for our perfect family getaway! We are grateful for this incredible affirmation of what we love to do: to give our Villa Ausblick visitors a wonderful, stress-free vacation they will long remember. Personally, we are deeply humbled knowing that at Villa Ausblick we allow for very special memories to be created. As in this case, a large family reunion of grandparents with adult children and young offspring spending the Holidays together. This was a family with 4 grown sons all serving in the Navy and traveling as far as from Japan! Very nice, big, clean house with amazing view and very well stocked up kitchen. Very nice, big, clean house with amazing view and very well stocked up kitchen. We rented the house for a ski trip for three families ( 6 adults + 6 kids) and were able to comfortably accommodate everybody in this beautiful house. Kids really appreciated a game room in the basement. The owner is really nice and helpful! Thank you for your kind words and giving credit to our amazing housekeeping team. Preparing a home this size is a daunting task requiring efficiency yet a keen eye for details. We are blessed to have a wonderful team on board who care as much about providing a clean and hospitable home as we do. I retired this year and promised myself 2 months to reflect on my future. Villa Ausblick was the perfect venue for my quest. Nestled at the end of a beautiful tree lined road, the home offered breathtaking views of the wooded mountains of Vermont, Every morning I would wake up, brew a pot of coffee and sit on the deck and marvel at the breath taking views.I watched as September turned to October and the autumn colors turned the hills from green to red, golden yellow, orange and colors in between. Magnificent! The pictures on the web site fairly represent the home, but do not do justice to the experience.The entire ownership and management team work seamlessly to make your stay effortless and noteworthy.Starting with Sibylle, the maestro of the Villa, to Jeanne and Eva, the on-site staff and Marc, the property manager, everyone makes certain you are comfortable and aware of all the sights available to view and sample.I felt pampered . Can not recommend Villa Ausblick more highly.I am already planning a return trip! What a special treat is was to host and take care of Steve for a longer-term stay. We love to develop personal relationships with our guests before their arrival and learn about their special interests. This allows us to create that a very personalized recreational experience our guests are looking for. For Steve it was to find an expert fishing guide to go on weekly excursions on the Waterbury Reservoir. My entire family absolutely loved staying at Villa Ausblick. Everything was perfect from the picturesque views, pool, pond, numerous areas to hang as a big group, all the kids indoor/outdoor toys (especially the nets to catch and release salamanders, fish and frogs from the pond). So many great activities to do to mention, but have to say that Bolton Falls are a must do. So glad we stayed at Villa Ausblick! Excellent property, perfect for a large group. We especially enjoyed sitting outside under the gazebo for dinner and on the deck after dark to star gaze. Home is stocked with everything you'd need. Would definitely return. Experiencing the beautiful night sky is yet another benefit of Villa Ausblick's exclusive location without any light pollution. On a cloudless night you can discover known star constellations, the Milky Way, and shooting stars. It's totally worth installing a star gazing App for that! Waterbury is centrally located at Exit 10 off Interstate 89, the state’s major north-south highway that winds along the spine of the Green Mountains. Route 100, dubbed “The Skiers’ Highway” as well as one of the most scenic drives in Vermont, threads through our region. The Mad River Byway and the Green Mountain Byway converge on our doorstep. The ski and summer resorts of Stowe, Bolton, Sugarbush and the Mad River Glen are readily accessed, and we are less than 30 minutes from Montpelier, Stowe, and Burlington. Adjacent to a State Park with unrestricted panoramic views of Camel's Hump - Vermont's 3rd tallest mountain, Villa Ausblick is centrally located within a 30-minute drive to 4 major ski resorts (Stowe, Sugarbush, Mad River Glen, Bolton). Nearby attractions include the beautiful Waterbury Reservoir Lake and Winooski River for canoeing, kayaking, fishing, swimming and boating. You can also choose amongst various golf courses and trails for hiking and mountain biking. Other tourist attractions are the Ben & Jerry's Ice Cream Factory, the Cold Hollow Cider Mill and all the amazing shopping opportunities nearby Stowe and Burlington have to offer. And don't forget to explore Vermont's abundant foodie scene and famous micro-breweries, all easily accessible for this central location of Vermont. So whether you are an outdoor enthusiast or simply want to enjoy live in a stunning setting, Villa Ausblick is a luxury home with many amenities for you and your group. Close to Burlington airport and Lake Champlain; 2 hrs from Montreal; 3 hrs from Boston. 5 ½ hrs from New York City. * Rates subject to change without notice. * The $375 Combo Fee covers these Villa Ausblick services: housekeeping, laundry, trash removal, pest control, property management. plowing & hot tub (fall/winter) or landscaping & swimming pool (spring/summer). * Check-in after 5pm; Check-out by 10am unless otherwise arranged. * Max. 12 guests. No pets. No smokers. No tenants under 25 years. Max. 4 cars. * RESERVATION REQUIREMENTS within 24 hours of online booking: 1) Reservation Deposit 2) signed Guest Agreement* 3) Photo ID (You will receive a personalized Guest Agreement, which you need to sign and return via email. Merely accepting the agreement posted online does NOT suffice.) * DISCLOSURE: This home comes with external cameras for the safety and security of our home and our guests.